Dressing room diaries are finally up on the blog. My favorite trend for this season! Tees. The official stay at home mom or any mom trend really. I can’t wait to wear this tee out on date night. I found this tee at Tj Maxx for only $12.99. I couldn’t believe the price tag. This tee goes well for many body types like myself. 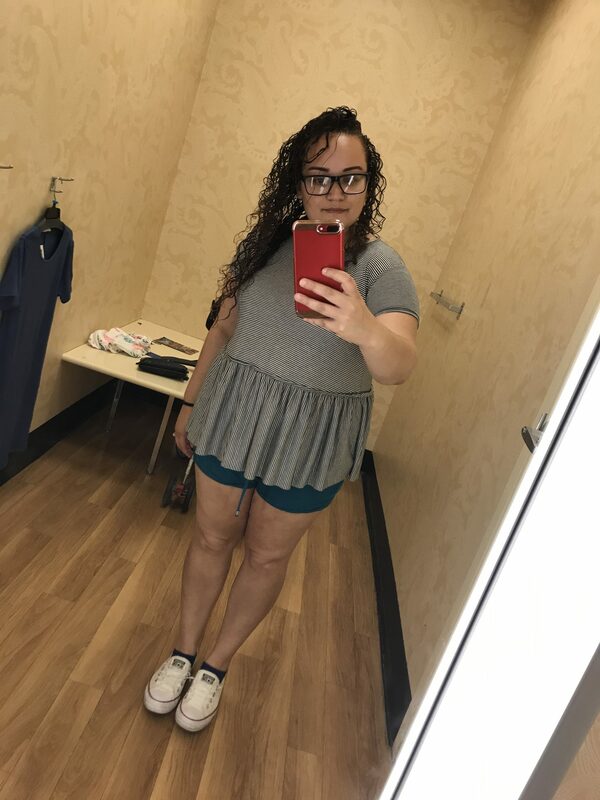 Since I still carry baby weight on my belly due to suffering from PCOS this covers my bottom/mid portion of my belly and doesn’t look frumpy. These stripes are also horizontal so they make your body look less chunky. I’ll have a look up for my Summer/Fall style date night guide. ? Thanks so much. I always try and stay within a budget for my whole outfit. Not a fan of this style myself but looks good on you! Thanks so much. I can understand that. I feel the same way about the off the shoulder trend.